Botryoidal aggregate of Gageite, a rare manganese and zinc silicate. 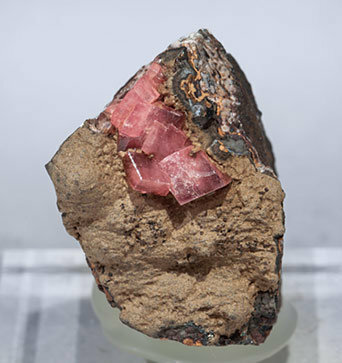 It has a greenish-brown color and is coating a matrix of manganese oxides crowned by a group of rhombohedral Rhodochrosite crystals that are translucent, bright and have a uniform pink color. The sample has been analyzed and we’ll send a copy of the analysis to the buyer.